Pittsburgh - A Modern Car House. 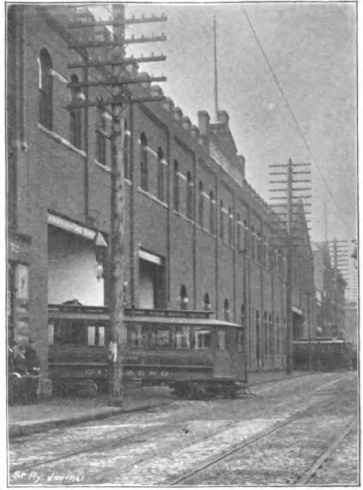 This article, from The Street Railway Journal, April, 1894, describes the new carhouse of Pittsburgh's Citizens Traction Company. FIG. 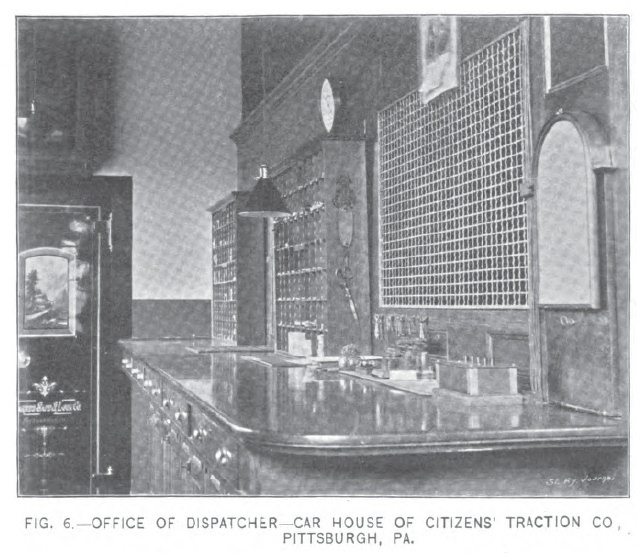 1 -- INTERIOR OF CAR HOUSE -- CITIZENS' TRACTION CO., PITTSBURGH, PA.
An event of much interest to Pittsburgh railway men was the inspection of the new car house of the Citizens' Traction Company, of that city, on February 22, by the president and directors of that road, together with a few invited guests. The house stands at the intersection of Penn and Franklin Avenues at the terminus of the company's Penn Avenue cable line. The present building, a handsome structure with massive brick walls and interior supports of heavy iron beams and girders, is an enlargement and alteration on a radical scale of the shed that formerly occupied this site. In the old quarters the storage space was so restricted that there was only room for three cars on the loop under the shed, and the storage and shifting had to be done by men and horses. While this was considered adequate at first, the business rapidly outgrew such slender provisions for service. When the cable cars were first put on, they were run under five minutes' headway; but at the end of one year, the business had so increased that the cars were run at intervals of only one and a half minutes during the busy hours of the day. 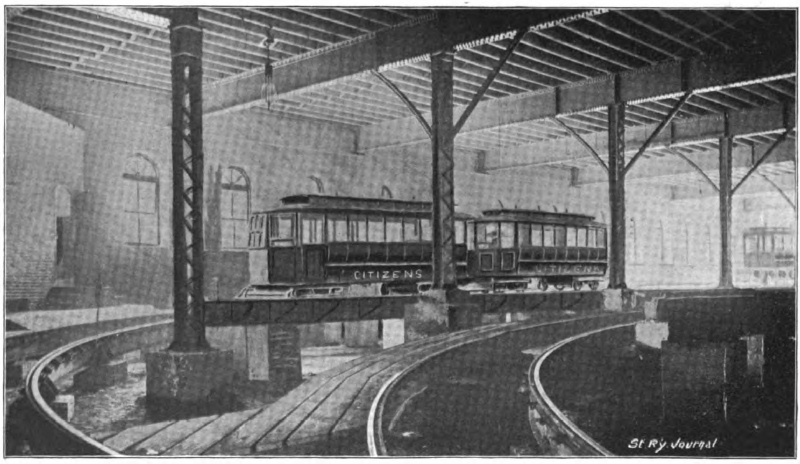 The result was that with the limited room on the loop in the shed, the management often had to begin ahead and run cars in a waiting line on the street, in order to properly dispatch them on time. All this caused no end of inconvenience to the company, and finally became a source of considerable annoyance to the neighboring residents. About a year ago the company decided to take steps to relieve the congestion of the street and to provide proper facilities for its increased and increasing business. It was left to J. E. Rugg, the widely known and efficient manager of the line to perfect and submit a plan of alteration suited to all the needs of the case. This he has not only done, but he has brought to bear on the task, as is shown by numerous details, knowledge that could only have been acquired through long years of experience. The work was begun in April, 1893, and during its progress the operation of the line was continued as usual and, though the cars were often run under one minute headway, not a single trip was missed. In the carrying out of the project and the construction of the building, Mr. Rugg was ably seconded by the company's engineer, William Bradford. 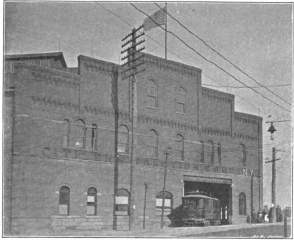 The alterations included the enlargement of the old building by an additional structure, 175 X 101 ft. A part of the old shed was then converted into a housing station and terminus of the Wilkensburg electric division of the Citizens' Traction Company. The old loop was taken up, and a new rope, 400 ft. long, introduced, making a new loop. This enters the building at its west end from Penn Avenue; thence passes through it along the south and east walls to Frankstown Avenue; thence through the street along the north side of the house to Penn Avenue again. Penn Avenue, at the intersection point, is considerably higher than Frankstown Avenue, and in the readaptation of the building this feature of the location has been ingeniously put to great use. As the cars enter the house from Penn Avenue, the cars drop the rope, and traverse all the loop by gravity. In addition to having a grade, the loop track is elevated, so that the grip does not have to be taken out. (Fig. 1.) An interesting feature of this track is the compounded grade. From Penn Avenue to the curve of 48 degs. radius, shown in the engraving, the grade is 2 per cent. ; at the curve, 3 per cent, and as the track leaves the building it falls to 0.6 per cent. FIGS. 2 AND 3. -- ELECTRIC TRANSFER TABLE -- CAR HOUSE OF CITIZENS' TRACTION CO., PITTSBURGH, PA. If it be intended to take the car out of service, as it enters the building it is shunted on to the switching track. 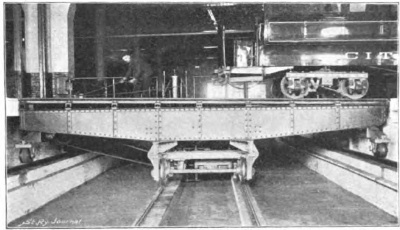 As this track is slotted, and elevated above the floor of the house with a grade, the car runs by gravity on to the electric shifter, without the grip being taken up. The tracks on the transfer table of this shifter are about five feet above the rail on which the shifter works, and match, in grade and elevation, the storage tracks. When the shifter moves to a given position, the car runs off and to its place by gravity, and without taking up the grip. The shifter is designed to operate on a curve. For bringing the car back on to the shifter, up the slight incline of the tracks, there is a little capstan on the transfer table. A rope with a hook, as shown in the engraving, is fastened to the car, and two or three turns taken around the capstan; a man takes up the slack, and the car is pulled into position. To dispatch the car on to the line, the shifter is brought back to the switching track, and the car runs to its place on the loop by gravity, and without taking up the grip. FIGS. 4 AND 5. -- VIEWS ON PENN AND FRANKLIN AVENUES -- CAR HOUSE OF CITIZENS' TRACTION CO., PITTSBURGH. PA. The advantages afforded by the ingenious substitution of gravity for power, and by elevated tracks leaving the grip untouched from the moment it enters the house until it leaves it, are obvious, both for economy of time and money. As compared with the method followed in the old shed, it means a saving of three horses and four men. 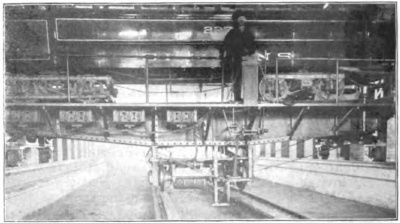 In the present arrangement there is employed one pitman to examine grips and do necessary cleaning, and one man has charge of the electric shifter and heating boiler. As a matter of time, the car can be taken off the cable connection on the street and put in proper place on the storage tracks in one minute. If in proper order of sequence, it can be put out for service in thirty seconds. The building is thoroughly heated throughout, and steam pipes run under all storage tracks which are high enough to allow an inspector to examine the cars on them. There are no conduits in the building. All tracks are elevated and all inclined. Other features of the house are a fireproof oil room and an admirably arranged office shown in Fig. 6. In this is a large box for receiving envelopes and reports, directly in front of the dispatcher. Beneath it is the cash drawer. Right behind the dispatcher is the telephone; on his left hand various drawers and cases of pigeon holes, while at the end of the office is the safe. Looking through one window, the dispatcher can see down the street several hundred feet; without moving from his place he can see the tracks in the house through another. Behind the office is a room for the division superintendent, with every convenience, including provision for sleeping during storms or unusual service. Back of this is a large toilet, and at one side a room especially devoted to accident reports, so that the men can make them out calmly and without diversion of attention. On the second story are large paint and repair shops lighted with monitor roofs, also a large forge, storage rooms and additional storage tracks. The total storage capacity of the building is for 100 cars. The cars are taken to the second story by an electric lift elevator. The current for the electric lighting and all power purposes comes from the company's electric power house, more than two miles away. For dispatching, nine cars can stand on the loop in the house and four on the switching track, counting one on the shifter in line with it, thus making thirteen cars ready for service. Throughout, the building is as orderly and clean as a well kept hotel. In convenient places waste barrels and cans for paper, oil rags, etc., are scattered through the house; and Mr. Rugg says that he is meeting with an encouraging use of them by the men. Not the least of the excellent features, that strike a visitor to this house, are the provisions for the comfort of employes, coupled with a wise discipline. A lobby 29 x 19 ft., well heated and admirably, lighted, is furnished the conductors and gripmen on the Frankstown Avenue side of the building. It is provided with an ample number of comfortable seats and connected with the office by electric calls. Out of it on one side opens a well kept lavatory, and on the other a coat room, 28 X 19 ft. In this each man has a separate locker, and each locker is provided with a wire door to let in light and heat on damp clothing. In the accident room previously referred to, a large shelf is provided, where the families of the employes can leave lunch or dinner pails. In speaking of this arrangement Mr. Rugg used these significant words: "We show the men that we respect them by doing this for them. Now, we expect them to respect themselves and show it by doing their duty to us." The visiting party, consisting of John G. Holmes, president, H. L. A. Stewart, C. L. Magee, James J. Donnell, John B. Jackson, directors, and George Wilson, solicitor of the company and a representative of the STREET RAILWAY JOURNAL, expressed great satisfaction with the building and its arrangement. Copyright 2013 by Joe Thompson. All rights reserved.